Former employees of 1711 Fulton St. in Bed-Stuy protested in front of the building in June, saying management laid off all union-affiliated maintenance workers. BEDFORD-STUYESANT — A Brooklyn housing complex's owner is being accused of cutting wages, threatening and ultimately firing union workers in a complaint filed Thursday with the National Labor Relations Board. Former maintenance workers at 1711 Fulton St., a state-subsidized Bed-Stuy apartment building, said they were fired in June after new management slashed their pay by nearly 50 percent and harassed them on the job. 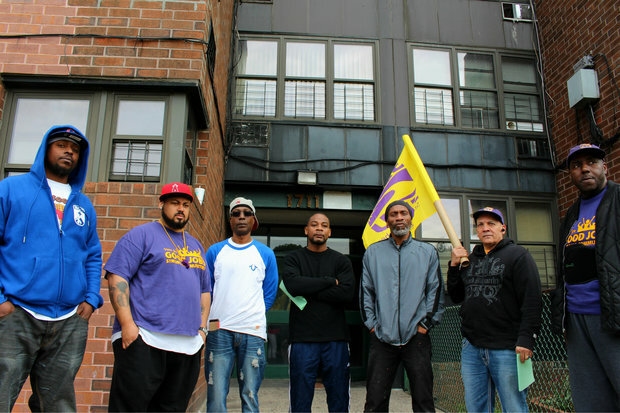 The group of porters, handymen and the superintendent are members of 32BJ SEIU, the union that filed unfair labor practices against Vertices Holdings LLC and Shinda Management Corporation. Workers said the trouble began in March after Vertices Holdings LLC took ownership over the four buildings and Shinda assumed management operations. Developer Bushburg Properties, Inc. acts as an agent of Vertices, according to the NLRB complaint. The complaint states that Vertices changed wages, vacation time, health insurance and pension for the union workers without prior notice to 32BJ SEIU and without a bargaining opportunity. Former workers also allege that management employees threatened them with physical violence and told them it “would be futile for them to be represented by a union,” according to the complaint. In addition, employees reportedly pressured maintenance staff with more tasks, workers said. Management fired the union workers on June 1, according to the complaint. Tenants joined former workers in a rally outside the building to protest the termination. Building sources previously told DNAinfo that management fired only two of the nine union employees, while the rest did not show up to work. Representatives for Vertices, Bushburg and Shinda did not immediately respond to requests for comment. “As the complaint makes clear, Mr. Hoffman and his company tried to deny these workers their rights and their humanity,” 32BJ Secretary-Treasurer Kyle Bragg said, referencing Abraham J. Hoffman, who is listed in city records as the property’s buyer. A trial date is set for Aug. 19 and the former workers will join tenants at 1711 Fulton St. for a rally and march on July 30.